"Overall, the book is a wistful analysis of interpersonal connection and its avatars in times of amazing technological advances and economic affluence. The authors’ social message is not lost to us: together we may be better for the environment as well as for each other." "A thought-provoking, engagingly lucid book. . . . [Olds and Schwartz] have written a wise, balanced, and evocative inquiry; their finger is on the pulse of something very real." "Like seminal works . 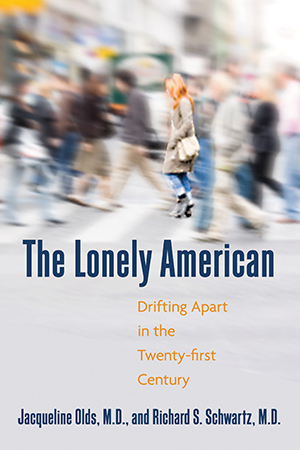 . . this recent addition to the sociological and psychological literature on loneliness is a substantive contribution. . . . The authors capture the essence of our depressed and disjointed culture, especially now that the economy is failing and workaholism is no longer a viable refuge for many. They offer no foolproof solutions, but they do successfully generate awareness of the problem and encourage the ubiquitous lonely Americans to seek attachment and commitment as they pursue happiness. Highly recommended for all public and university libraries."